Every time Jane and I visit Hawaii, we love taking daily road trips to explore every part of the beautiful island. While Jane gets the kids ready, I would run down to the closest ABC store to pick up snacks and drinks for our daytrip. 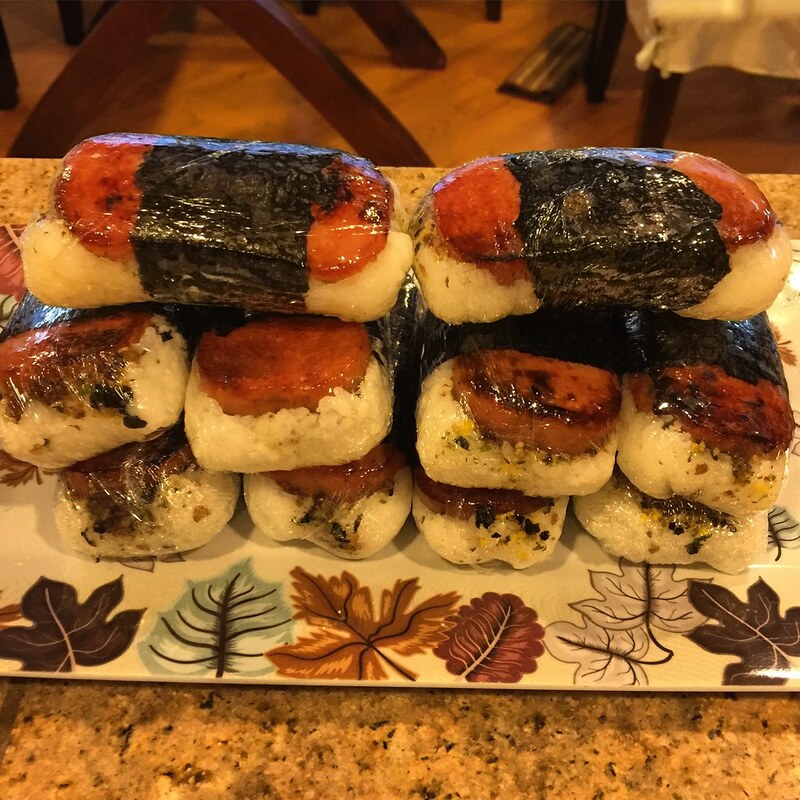 One of our favorite snacks to pick up is Spam Musubi. It is the perfect handy snack to eat on the go, hot or cold, and any time of day. The white rice balances out the saltiness of the spam and sweetness of the sauce. There are many variations of the Spam Musubi out there, but some of the best Spam Musubi I have eaten had a sprinkle of Furikake rice seasoning on the rice. I really hate places that overload their Spam Musubi with rice and top with a small and shady piece of Spam. I tried my best to find the perfect Spam to Rice ratio for this recipe. This is the perfect appetizer, snack, and potluck food that is surely a total crowd pleaser. For this recipe, I used a large Sushi Maker that I bought at Daiso. The link takes you to a similar mold I found on Amazon. 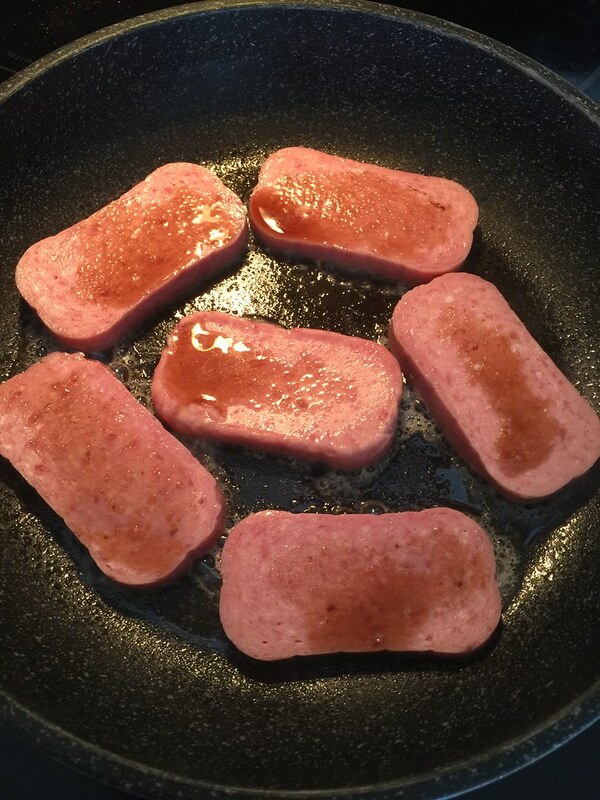 Fry Spam – On medium high heat, fry spam slices 2 minutes on each side or until lightly browned. While the first side of Spam is frying, add a little soy sauce and sprinkle some sugar on top of each piece of spam. Repeat soy sauce and sugar step once Spam is flipped. Assemble Spam Musubi – On a clean working space, lay 2 nori strips about 1/3 of the length and 2/3 of the length of the large sushi maker. Center and place the shaper piece over the two sheets of nori. Spread 1 cup of cooked rice into the shaper evenly and press rice tightly with the compressor. Sprinkle rice with about 1-2 teaspoons of Furikake rice seasoning, coating rice evenly. Top the rice with two slices of Spam. Press spam tightly with the compressor and using both hands gently lift up the shaper from the Spam and rice and remove compressor. Wrap nori over the top of spam and rice, sealing edges with a small amount of water. Cut in the middle to form two Spam Musubi pieces. 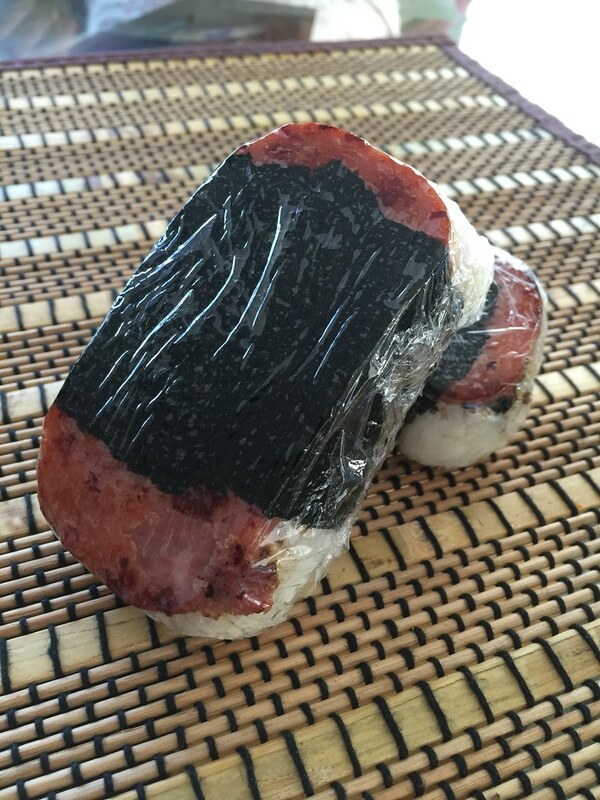 Wrap each Spam Musubi tightly in clear plastic wrap and form Spam Musubi in the shape of the sliced Spam. Repeat. If using a single Spam Musubi mold, add 1/2 cup of rice only. If you do not have a Sushi Maker, place 1/2 cup rice on a piece of spam and form the mold with your hands and then wrap immediately on clear plastic wrap. Make sure to oil your hands a bit so the rice doesn’t stick.